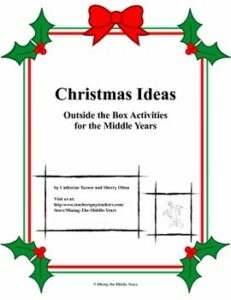 Christmas Ideas and Activities created by Mining the Middle Years engages students in seasonal open ended activities to stretch their thinking beyond the basics. These activities are great for differentiated instruction to reach a wide range of student learners. These activities offer a twist to traditional Christmas activities. These activities are designed to be inclusive of a variety of learning styles. Activities and ideas are interdisciplinary in nature and include: writing, math, science, socials, drama, music and P.E.